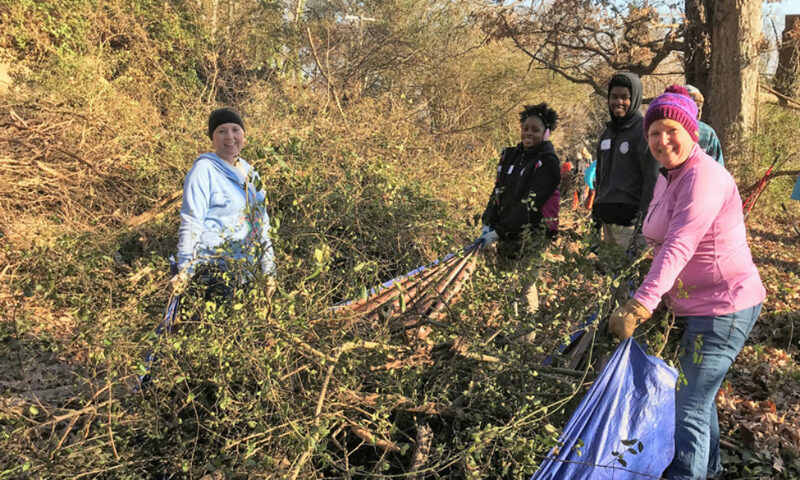 Dr. Martin Luther King Jr.’s statement, “the time is always right to do what is right”, rang especially true this week when more than 100 people, from all walks of life, and from all over the City, braved unusually chilly weather to work together to honor his legacy. And what a “right” day it was. 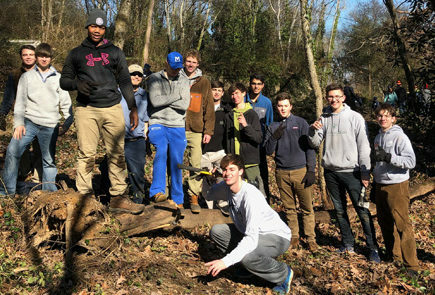 Instead of taking the day off, students from Girls Prep School, McCallie School, and Southern Adventist University joined with their classmates and the Lookout Mountain Conservancy’s Leadership Interns from the Howard School to help transform a portion of the Mountain’s John Wilson Park into a community treasure and a haven for threatened butterflies and other pollinators. Despite the frosty air, doing the right thing meant working together, side-by-side, with smiles, clippers, loppers, and saws. CEO of the Conservancy who has lived here in Chattanooga for more than 30 years and remembers listening to Dr. King on the radio. After three hours of hard work, supplemented by warming fires and hot chocolate carefully tended by the Leadership Interns, the results were impressive. Massive piles of invasive plants were removed leaving open ground for new, butterfly-friendly, plants in the coming spring. Tired, but satisfied, new friends sat and sipped hot chocolate together. And for many, a renewed sense of hope and purpose had come alive. What an incredible way to start off 2018. We salute Dr. King, Jr. and all those who came together to remember his legacy, up on Lookout Mountain, as together, we change the lives of those who live here for the better, one day at a time.